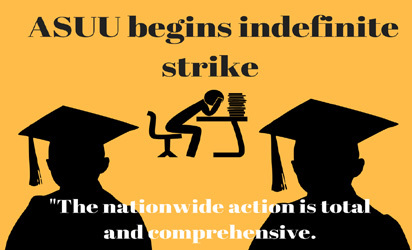 Academic Staff Union of Universities, ASUU has commenced strike. Also the organised labour Sunday night shunned meeting organised by the Federal Government to resolve the impasse on the new minimum wage. One of the key officers of the Nigeria Labour Congress, NLC, told Vanguard that the meeting was irrelevant as the only meeting they would attend was the one scheduled today for the signing of the report of the Tripartite Committee. It was reliably gathered that labour leaders switched off the phone lines to avoid distraction from the government team. The Federal Government has decided to punish some unions that would heed the directive of the labour centres to proceed on strike action Tuesday.